There’s nothing really that great about September. Work cuts the ‘summer Friday’ early finishes, all you hear is mutters that summer is over and ‘how many days of sun did we really have?’, somebody is guaranteed to mention how many sleeps there are until Christmas, there are no more bank Holidays, and most heart-breakingly, pick n mix at Wilkinson goes back up to full price now the kids are back at school. Whether you’ve taken a summer break or not, September is the time that you start itching for another and following on links on the EasyJet super sale email that lands conveniently in your inbox. Sometimes, it pays to give into temptation and there are many tempting elements about Krakow in September. Just a two and a half hour flight from most UK major airports, Poland’s city is the ideal place for a spontaneous getaway. With flights running conveniently almost every day and on budget airline, Ryanair, for a steal £16.99 each way, and a full meal equating to roughly £5 on average, for many it may actually be cheaper to ditch the regular commute and Pret a Manger lunches and enjoy a long weekend away. September covers Krakow like a timeless chiffon scarf. The temperatures are warm, not so much so that it’s uncomfortable to do the walking that’s needed to soak in every element of the towns, but to kiss the skin lightly. Outdoor eateries and bars seating spills onto the cobbled streets, and from early morning to late night, Krakow’s old town offers a view that is unrivalled. One of the most architecturally stunning historic towns, the Rynek Główny takes centre stage making it the largest medieval market squares in central Europe. Lined by public green space known as the ‘planty’, Krakow is one of the quietest and most peaceful cities that I have had the pleasure of visiting. There’s a definite tranquility in the old town despite its standard £1 equivalent price tag for a spirit and mixture, as tourists and locals alike respect the historic sentiment of the town and large religious communities and instead drink and enjoy the fountains, round-the-clock street performers and majestic horses. On the other side of the city, the Jewish quarter has gained respectable hipster credibility. Where walls are adorned with street art and Instagram backdrops, Kazimierz was originally the centre for Jewish life. It was destroyed in World War 2 and gained a slightly off-kilter reputation during the communist era, yet rebounded during the 1990s as a bohemian district. Art galleries line the streets alongside independent retailers and traditional restaurants serving hearty and warm specialalities of dumplings and ales. Historic sites like the Corpus Christi Church and the Tempel Synagogue, are tucked beside wooden-shutter antique shops. During the evening, traditional music flutters through the air as buskers add a truly authentic feel to the district. A few hours later, old war-time courtyards are transformed into ultimate hangouts where pop up bars and ice cream stalls (you may have to wait up to half an hour to try Lody, but it’s worth it) act as meeting points for late bowling games and underground night clubs. 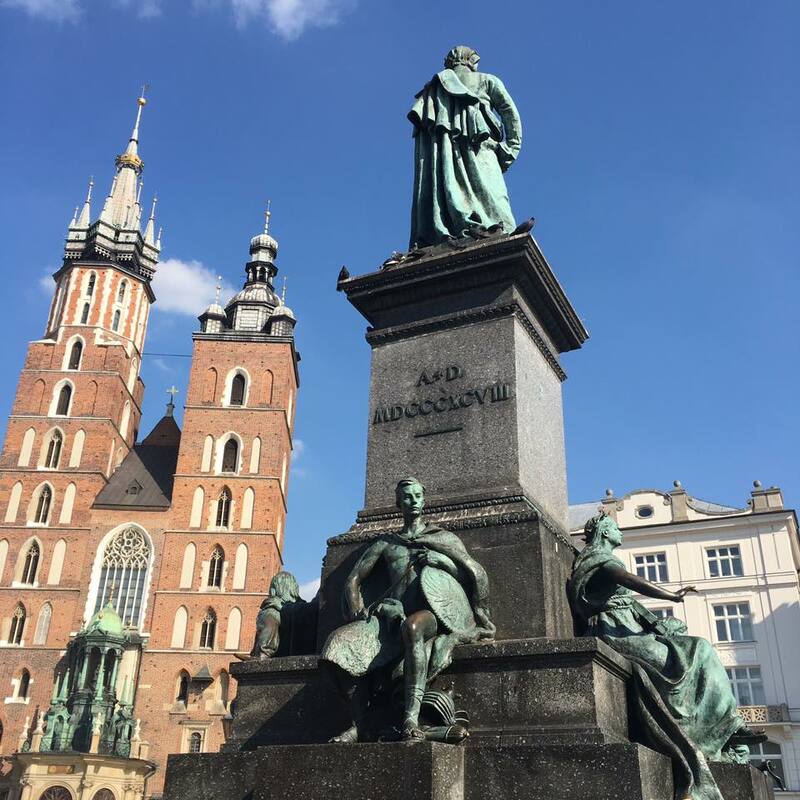 The sheer beauty of Krakow, from the blue river that runs through the town, to the straight-from-a-painting places of prayer, to the endless lush green grass parks and the story-book Wawel castle that majestically overlooks the city, can make you forget the history. Yet the retaliation and kind nature of Krakow makes this history even more striking. A trip to the Auschwitz concentration camps is highly encouraged, for a day of reflection and sign of respect to the country. Trips run daily from the town centre and can be booked through most hotels. The tour guides do everything in their power to make it smooth running and as comfortable as possible for visitors whilst educating of the tragic reality. Read more about the trips here. A visit to Wieliczka salt mine is also recommended, the 13th century salt mine offers two routes to guests; tourist and worker, and each allows full exploration underground providing stunning illumination whilst learning about the mining tradition and lifestyle. Krakow is more than just a city break, in that it places you in the centre of history and you feel the overpowering desire to learn more. Museums and art galleries, that offer insight into past life in the towns and religious history are often free or ask for a small entrance fee, and open early in the morning so that two or three nights in the city is just about enough to cover all and have time for a breather. Yet I’d argue that Krakow is best covered on foot where possible, as every street offers a new finding, whether it’s a 10p bagel stall, angel statues under bridges, or a fire breathing dragon. Walking tour guides may be found on every corner, and talk passionately about the strength and solidarity in the town, whilst also pointing out the best of local living. Krakow is a city that welcomes the open-minded. It wants to educate, and ensure that people keep visiting to keep its history alive. A quiet place for reflection and peace, with homely, filling food, it’s the perfect place for a September break. Just be sure to take a few zloty in change, because wherever you are, you’ll have to pay to use a toilet!